The other morning as I was driving to work around Chapman’s Peak I looked back on this scene and had to stop to get a photo. It was incredible with the cloud hanging over the mountains with a few gaps here and there just after sunrise with blue sky behind – September 2012. One photo just wasn’t enough! I was just there last November. So beautiful. I can assure you though my photo did not look like this! Thanks for posting. It reminded me how much I enjoyed my trip to SA and how much I loved this view outside of Capetown. It is a beautiful city to live in. Glad you liked it and hope you make it back to see this ever changing view again in the future. It’s quite unique isn’t it. Stunning shot Rory. 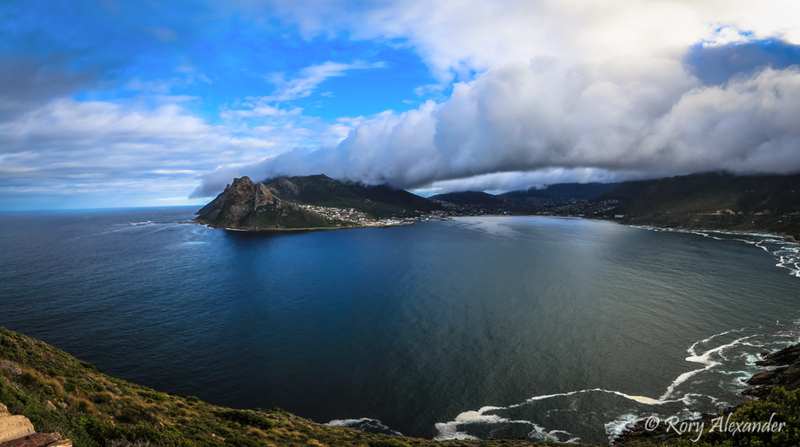 Houtbay is a very beautiful place indeed…. That is gorgeous, and the clouds look like a bridge that I could walk across. Hey, Rory. Thanks for the follow. Almost looks like Table Mountain cloud cover over Hout! I have a shot from just down the road to the left of where this is taken… with a whale spouting in the bai. I’m trying to remember… is this before or after driving through the tunnel? Hi there, it depends on which direction you are travelling but this is taken about a third of the way along Chapman’s Peak Drive as you leave Hout Bay going towards Noordhoek. The Swiss half tunnels that were built as protection from the rock falls are further along around the corner. Amazing pic! So privileged to live here!